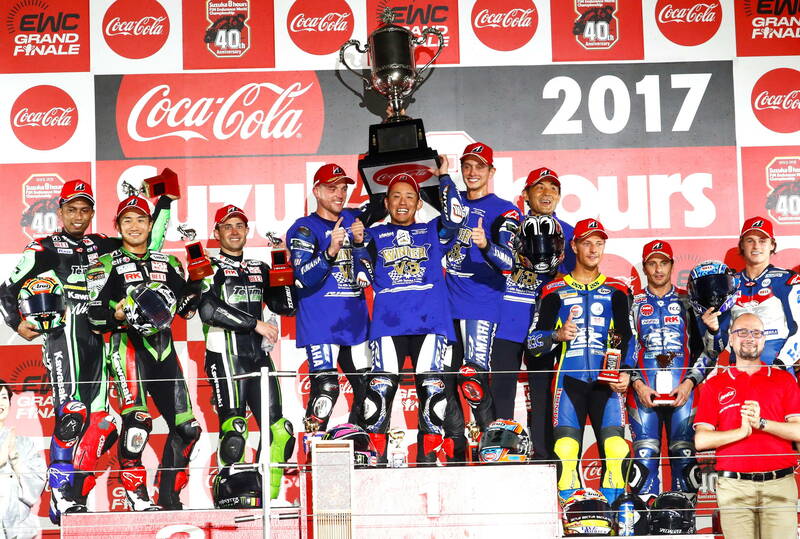 Yamaha Takes Third Straight Suzuka 8 Hour Victory. The prestigious Suzuka 8 Hour team competition was held last weekend, and the Yamaha Factory Racing Team took its third consecutive win in the event with riders Katsuyuki Nakasuga, Alex Lowes and Michael van der Mark. The Yamaha trio dominated the race, ending more than a lap clear of second place Kawasaki. Here is a press release from Yamaha, followed by a list of the top 10 finishers. The YART Yamaha Official EWC Team have consistently remained the top performers outside of the top five teams this weekend, and today’s race proved no exception. Broc Parkes was the first man on track, initially dropping to 9th in the first hour. Nozane then took over, and from there the team took turns to fight back, upping the pace until they were able to hold 5th position. A last minute technical issue with a chain adjuster cost a place but Nozane was able to bring it back to fifth and ensure that YART secured third place in the 2016-2017 FIM Endurance World Championship. Is it just me or has that trophy gotten smaller? I remember dwarfing riders in the past. “The prestigious SUZUKI 8 Hour team competition was held last weekend…” I think you mean Suzuka. You mean, like in the headline? You think ol’ autocorrect might have Suzuki but not Suzuka? Sheesh, hope your day has more than this to worry about in it. Easy, now. It needed to be fixed if only to make the headline correct for searching the article archives. Everyone in print/design learns sooner or later how easy it is to miss the typo in the largest type on the page! As someone who has to write a lot, I appreciate when others catch my errors. even if he typed it right…? most forms of auto-correct would’ve likely made it wrong.